On November 1, 1818, Father Joseph-Norbert Provencher built on this site a small log chapel which he dedicated to Saint Boniface, the English missionary monk and apostle, who spread the Catholic faith among the Germanic tribes in the 8th century. Saint Boniface, the first permanent mission west of the Great Lakes, became the heart of Roman Catholic missionary activity extending to the Pacific and Arctic coasts, as well as serving the growing population of the Red River Settlement. Five cathedrals have stood on this beautiful location. In 1832, Bishop Provencher erected a cathedral surmounted by twin spires, and in 1862 a stone cathedral was built under the direction of Bishop Taché. On August 15, 1906, Archbishop Langevin blessed the cornerstone of what became one of the most imposing churches in Western Canada. It was designed by the Montreal architectural firm of Marchand and Haskell. 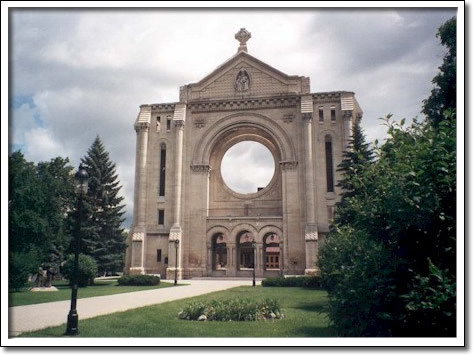 This structure, the best example of French Romanesque architecture in Manitoba, was ravaged by fire on July 22, 1968. The present cathedral, blessed by Archbishop Baudoux in 1972, was designed by Franco-Manitoba architect Étienne Gaboury. It incorporates the sacristy, façade and walls of the former basilica. In the façade lie the tombs of the bishops of Saint-Boniface. Louis Riel, together with many of the West’s first Catholic settlers, key figures and missionaries, is buried here in Western Canada’s oldest Catholic cemetery.